The AWC winner was announced at the 2017 Denver Clive Cussler Collector's Society Convention on 10/7/17. 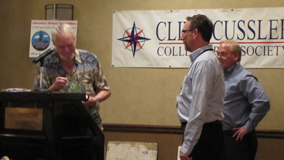 The AWC winner was announced at the 2016 Denver Clive Cussler Collector's Society Convention on 10/8/16. 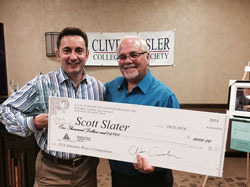 Scott Slater’s Blood of my Blood won the 2014 Adventure Writer’s Competition. Clive Cussler’s daughters Terri and Dayna, along with Competition and Panel Director Kerry Frey presented Slater with the coveted Grandmaster Award and winning $1000 check. Slater’s entry beat out fellow finalists Nate Granzow’s Cogar’s Revolt and Dave Bullock’s Forced Succession to win the grand prize, and according to Frey all three entries were elite adventure novels. “Scott was elated to win the award,” 2012 Winner Peter Greene said. “We’re happy he joins Jeff Edwards, Ian Kharitonov, and myself in the AWC winner family, and we all look forward to his career in publishing.” Frey announced at the awards ceremony that over 200,000 books have been published world-wide by the winners alone, so Slater joins an elite group already. The Society congratulates all the contestants of the 2014 competition, and encourages writers of adventure novels who meet the rules to consider submitting entries for future competitions. At the end of the ceremony, Frey announced he was stepping down as the Competition and Panel Director to be replaced by 2012 winner Peter Greene. Greene will be announcing soon the specific requirements for the 2016 Adventure Writer’s Competition. We are proud to announce that Scott Slater's Blood of my Blood, Nate Granzow’s Cogar’s Revolt, and Dave Bullock's Forced Succession have been selected as the 2014 Adventure Writer’s Competition - TOP 3. The winner of the competition will be announced in Scottsdale, Arizona at the 2014 Clive Cussler Collector’s Society Annual Convention to be held at the Millennium Resort & Villa on October 10-12. Our sincerest best wishes go out to all the authors who participated, and we encourage everyone to purchase tickets and attend the convention. One of our authors has had to unfortunately withdraw from the competition. Congratulations to the following authors who have been selected for the next-phase of the 2014 Adventure Writer’s Competition. Chosen to the Top 10 by our panel judges – they will now submit their full manuscripts. And to those authors who did not make the Top 10, our fondest wishes for success. We hope to see your manuscript published in the future. Next Competition Milestone: The Top 3 Finalist will then be announced the week of May 5th. The 2012 Adventure Writer's Competition is officially closed for the receipt of new entries. The Top 10 entries will be selected on the week of February 3rd from the submittals provided. Congratulations to those who successfully submitted synopsis. The competition opens October 1, 2013 at midnight EST, and closes November 15th, 2013 at midnight EST, or after the receipt of 50 entries. A synopsis of the novel, no less than 500 words or greater than 1,000 words must be provided by email to: adventurewriterscompetition@gmail.com during the submittal window. The synopsis must give an impression of the narrative arc of the novel, the impact to the characters, how they are changed, and a feel for the action that drives them through the plot. Fantasy and Science Fiction will not be accepted. Judging: The first 50 submitted synopsis (which meet the requirements of the competition) will be judged by a select panel composed of recognized authors and members from the Clive Cussler Collectors Society. Entrants will be notified by email if their submittal was accepted or not. From those successful entries, 10 preliminary finalists will be down selected. That group will be notified and asked to provide their full manuscript the week of February 3rd. The other 40 entrants will be notified that they are out of the competition at that time. The 10 full manuscripts will be judged by the panel and down selected to a Top 3. The Top 3 will be notified of their selection, and the remaining 7 notified that they are out of the competition the week of May 5th. 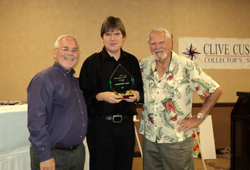 The Top 3 Finalist will be encouraged to attend the 2014 Clive Cussler Collector’s Society Annual Convention (site TBD) in October 2014 where the winner will be announced. Eligibility: (a) Participants must be 18 years of age by October 1, 2013. (b) The Adventure Writers' Competition is open only to unpublished writers. *An “unpublished writer" is defined as: an author whose fictional work has not appeared in book, magazine, or periodical format via a Fortune 500 recognized publishing firm. Self-published/Vanity Press authors are eligible as long as their work has not appeared in any of the formats listed above. (c) Clive Cussler Collectors Society' Officers, Panel Judges, and their families/relatives are not eligible for the contest. Rules & Submittal Requirements: (a) Full-length submittals must be original and cannot include characters from another authors' work - i.e. fan-fiction is not allowed. (b) The length of the manuscript shall not exceed 130K words or less than 50K words. (c) Format: 12 pt.- Times New Roman font, paginated and double-spaced with one-inch margins, and numbered pages. (d) Writers may only submit one manuscript. (e) Submitted manuscripts must be of the action-adventure genre. The story must have action and conflict, and the reader must identify with the character(s) in order to draw them into the plot. Fantasy and Science Fiction entries will not be accepted. (f) The deadline of the competition is October 31, 2013. (g) Attendance to the Clive Cussler Collector's Society Convention is not required to claim the Grand Prize. (h) A minimum of 10 entries will need to be submitted by the deadline for this competition to take place, with a maximum of 50. Competitors' Rights: (a) By submitting a synopsis/manuscript to the competition, the author (i) certifies their eligibility per the contest eligibility rules, (ii) grants the Society the right to publish excerpts on the web site, Facebook page, and in conference material, (iii) grants the Society the right to forward the winning manuscript to participating Literary agents for consideration, (iv) represents or warrants their work to be original and to have not used licensed material owned by someone else - thus being libelous, or infringing or violating the rights of any third parties, (v) and agrees to not submit their work to any other publisher, competition or self-publish until notified of their elimination from the contest. (b) By entering this competition, the author (i) acknowledges the competition will be conducted in good-faith by members of the Clive Cussler Collectors Society acting as judges and overseers of the process, and (ii) agrees to not hold the Society responsible for violating copyright infringements both during and beyond the competition. The Prize: (a) The Clive Cussler Award winner will receive a $1000 cash prize and additional amenities to be named at a later date. (b) The winner will be announced at the 2014 Clive Cussler Collector's Society Convention. The location and date of the event will be announced at a later time. (c) Dirk Cussler will select the winner from the top finalists. How to Enter: Information on the contest can be found on the Adventure Writer’s Competition Facebook page or solicited through Kerry Frey - c/o the Clive Cussler Collectors Society. Peter Greene’s "The Adventures of Jonathan Moore: Skull Eye Island" won the 2012 Adventure Writers Competition. Clive Cussler and Kerry Frey presented Peter with the Adventure Writer's Grandmaster Award and $1,000.00 at the Clive Cussler Collector's Society 2012 Scottsdale, AZ. Convention on October 6, 2012. Kerry Frey, Competition and Panel Director opened the ceremony by giving a background on how the competition was conducted. He recognized prior winners Jeff Edwards and Ian Kharitonov, and then acknowledged the seven panel members who graded the manuscripts. Frey announced the competition’s Top Five: The Adventures of Jonathan Moore: Skull Eye Island by Peter Greene, Zero Point by Tim Fairchild, The Devil’s Accomplice by Scott Slater, Revenge of the Maya by John Schofield and English as A Second Life by Patrick Parr. Four of the twenty-six competition authors were in the audience and were recognized – Peter Greene, Tim Fairchild, Scott Slater, and Patrick Parr. Peter was stunned when his name was called, and became even more so when Clive announced to the audience that his manuscript was “a fabulous read”. “To have Clive Cussler and Dirk Cussler read my book is truly mind-blowing,” said Greene. Jeff Edwards, the 2008 winner, met with the four authors afterwards and shared his experiences and offered advice. "Everyone left bettered prepared to face the rigors of publishing," Frey said. The Society congratulates all the 2012 competition participants. Call for manuscripts for the 2014 Competition will occur in October 2013. Please look for an official announcement here on the Society’s web page, and on the Adventure Writer’s Competition Facebook fan page. Congratulations to all 26 authors who participated this year. The quality and content of their manuscripts made it a difficult yet rewarding challenge to choose a top 5. Each story brought a unique and engaging approach to adventure, and demonstrated what we already suspected – that there are a lot of talented authors out there just awaiting the chance to be read. The winner will be announced the night of October 6th in Phoenix, Arizona at the eighth annual Clive Cussler Collector’s Society Convention. Please visit the Society’s web page (cusslersociety.com) for details of how you can attend. Once you access Adventure Writer’s Competition on Facebook, you will note a button on the left hand side of the screen marked “voting”. That link will take you to the opening chapters of the competition manuscripts. Please read each one and vote for your favorite. These votes will be combined with our judges inputs to determine the Top 5. Public voting will remain open until January 1, 2012. Due to a clerical error - the competition has been expanded to 26 entries this year. Please note that The Sword Of David by Steve Wilkens has been added to the 2nd page. The 2012 Adventure Writer's Competition is officially closed for the receipt of new entries. Twenty-six qualified manuscripts have been received, and are being prepared for submittal to the competition panel for the first round of judging. All the authors have been notified via email of their official acceptance in the competition. Please check back here in the near future to see how you can read the opening chapters of each and vote for your favorite entry. We are pleased to announce the panel members for the 2012 Adventure Writer's Competition. Authors Jeff Edwards, Ian Kharitonov, Sean Ellis, and J.D. (Jimmy) Gordon; and Clive Cussler Collector's Society members Pete Ragan, Lara Marchesi, Morgan Yates, John Vinson, and Lynn Rice. Due to a clerical error - the competition has been expanded to 26 entries this year. Please note that The Sword Of David by Steve Wilkens has been added to the 2nd page. (a) Participants must be 18 years of age by October 1, 2011. An “unpublished writer" is defined as: an author whose fictional work has not appeared in book, magazine, or periodical format via a Fortune 500 recognized publishing firm. Self-published/Vanity Press authors are eligible as long as their work has not appeared in any of the formats listed above. (c) Clive Cussler Collectors Society' Officers, Panel Judges, and their families/relatives are not eligible for the contest. (a) Full-length submittals must be original and cannot include characters from another authors' work - i.e. fan-fiction is not allowed. (b) The length of the manuscript shall not exceed 130K words or less than 50K words. (c) Format: 12 pt.- Times New Roman font, paginated and double-spaced with one-inch margins, and numbered pages. (d) Writers may only submit one manuscript. (e) Submitted manuscripts must be of the action-adventure genre. The story must have action and conflict, and the reader must identify with the character(s) in order to draw them into the plot. Fantasy and Science Fiction entries will not be accepted. (f) The deadline of the competition is January 1, 2012. (g) Attendance to the Clive Cussler Collector's Society Convention is not required to claim the Grand Prize. (h) A minimum of 10 entries/manuscripts will need to be submitted by the deadline for this competition to take place, with a maximum of 26 entries/manuscripts. The first 26 submitted manuscripts (which meet the requirements of the competition) will be judged by a select panel composed of recognized authors and members from the Clive Cussler Collectors Society. The manuscripts’ opening chapters will also be posted on the competition’s Facebook page for fans to vote for their favorite Top 5. Voters will do this by hitting the “like button”. The panel members input will be weighted heavier than the votes from the Facebook site. From a compellation of these votes, the 65 will be down-selected to the top three finalists. (a) By submitting a manuscript to the competition, the author (i) certifies their eligibility per the contest eligibility rules, (ii) grants the Society the right to publish excerpts on the web site, Facebook page, and in conference material, (iii) grants the Society the right to forward the winning manuscript to participating Literary agents for consideration, (iv) represents or warrants their work to be original and to have not used licensed material owned by someone else - thus being libelous, or infringing or violating the rights of any third parties, (v) and agrees to not submit their work to any other publisher, competition or self-publish until notified of their elimination from the contest. (b) By entering this competition, the author (i) acknowledges the competition will be conducted in good-faith by members of the Clive Cussler Collectors Society acting as judges and overseers of the process, and (ii) agrees to not hold the Society responsible for violating copyright infringements both during and beyond the competition. (a) The Clive Cussler Award winner will receive a $1000 cash prize and additional amenities to be named at a later date. 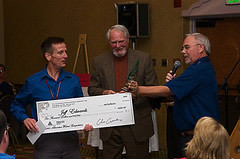 (b) The winner will be announced at the 2012 Clive Cussler Collector's Society Convention. The location and date of the event will be announced at a later time. (c) Dirk Cussler will select the winner from the top finalists. Information on the contest can be found on the Adventure Writer’s Competition Facebook page or solicited through Kerry Frey - c/o the Clive Cussler Collectors Society. Ian Kharitonov's "The Russian Renaissance" won the 2010 Adventure Writers Competition. Clive Cussler and Kerry Frey are presenting Ian with the trophy and $1000.00 Adventure Writer's Grandmaster Award at the Clive Cussler Collector's Society 2010 Scottsdale, AZ. Convention on September 11, 2010. Kerry Frey, Competition and Panel Director opened the ceremony by giving a background on how the competition was conducted. He then recognized the eight panel members who graded the manuscripts, several of whom were in the audience - Sean Ellis, Lara Marchesi, and Morgan Yates. Frey then announced the competitions Top Five: Brian Bryans - Sand, Matt Cook - Sabotage, Barry Grant - Hell's Fury, Ian Kharitonov - The Russian Renaissance, and Lynn Rice - The Yezdi Link. Four of the twenty-four competition authors were in the audience and were recognized - Matt Cook, Ian Kharitonov, Lynn Rice, and Bob Woodward. Ian was speechless as he received the award, but did recognize his parents - Igor and Elena, several long time friends from the society, and thanked Clive, Dirk, and the co-authors for inspiring him through their work. It was a priceless moment that won't be forgotten anytime soon. The Society congratulates all the 2010 competition participants - and will announce the next Adventure Writer's Competition in the spring of 2011. Please look for that announcement via email and on the Society's web page. Jeff Edwards - Award winning author of "Torpedo" & the Inaugural "2008" Adventure Writer's Competition Winner! Tony Eldridge - author of "The Samson Effect"
Sean Ellis - author of "The Shroud of Heaven" & co-author of "The Clive Cussler Code"
J.D. Gordon - author of "Caribbean Calling"
Each manuscript was critiqued for: opening, setting, characterization, plot line, dialogue, narrative, pacing, motivation, point of view, style/voice, relationship, mechanics, format, and overall impression. Scores were tallied, combined, and evaluated to determine the top 5. Lynn Rice - The Yezdi Link. Congratulations to the Top 5 authors - and a special thanks to all the participants. The quality of the manuscripts made the panel member's job of picking a top 5 a difficult task. The winner will be announced at the September Clive Cussler Collector's Society Convention in Scottsdale, Arizona. Hope to see everyone there! Kerry Frey 2010 Adventure Writer's Competition & Panel Director c/o The Clive Cussler Collector's Society. Jeff Edwards' "The Seventh Angel" won the 2008 Adventure Writers Competition. Clive Cussler and Kerry Frey are presenting Jeff with the $1000.00 award at the Clive Cussler Collector's Society 2008 Denver Convention. Fourteen (14) full-length adventure novels were submitted by aspiring authors to the 2008 Adventure Writers Competition by the March 1, 2008 deadline - all vying for the $1,000 prize and recognition as the inaugural winner of The Grandmaster Award. Judging these manuscripts will be done using a scoring template that will focus on setting, characterization, plot line, dialogue, narrative, pacing, motivation, point-of-view, style/voice, mechanics, format, and overall impression (to name a few). Society members will serve as Panel Readers. The top three (3) manuscripts by score will then be forwarded to Dirk Cussler who will select the winner & runner-ups. These selections will be announced in Denver, Colorado at the October 2008 Clive Cussler Convention. Congratulations to all the entrants for successfully completing their manuscripts and good luck to each as the competition selection process gets underway.